Just saw two new covers by Brian Bolland in the May Previews. Both of them are recreations. 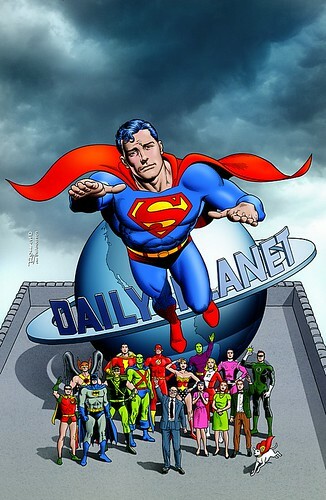 Bolland recreates Curt Swan's classic cover to Action Comics #583, the concluding chapter of "Whatever Happened to the Man of Tomorrow". This will be the cover to a deluxe hardcover of the same name, which will also include two other Moore stories: "For the Man Who Has Everything" and the Superman-Swamp Thing team-up from DC Comics Presents. I have to admit I am tempted to buy that collection. DC is trying to get product into the market that will appeal to Moore fans still on a Watchman-movie high. 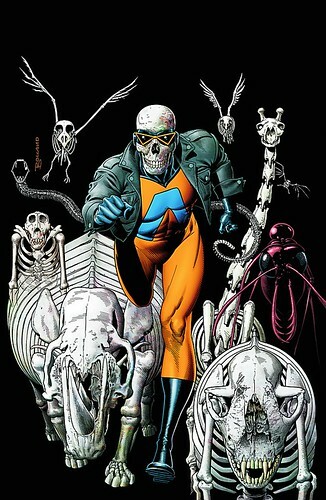 Bolland riffs on his work for this cover to "The Last Days of Animal Man". This cover is inspired by Animal Man #1, the series that made Grant Morrison famous here in the USA. I'm excited to learn that Gerry Conway is writing this mini-series! Conway is one of my favorite Silver Age writers of all time, he stopped working in comics during the 80s and transitioned to TV/Film writing. I'm excited and scared at the same time. I really want Conway to knock this one out of the park and get back into comics. He's inspired a gazillion comics/TV writers, wouldn't it be great if he could reap the rewards that the industry can offer now? Nuff said.